Set in an alpine valley at the foot of Titlis, Engelberg, the “Mountain of Angels,” is one of Central Switzerland’s most scenic villages. Founded in 1120 by Benedictine monks, Engelberg is renowned for its historic monastery and offers ample opportunities for outdoor activities. A popular alternative to nearby Lucerne, Engelberg makes a strategic base camp for exploring the surrounding mountains. Cable cars run up to the summit station of Titlis mountain for the most impressive views, and a network of hiking trails run throughout the valley. Day trips from Zurich to Lucerne often include a visit to Engelberg, where highlights include a tour of the Benedictine monastery, a visit to the Engelberg cheese factory, and a walking tour of the alpine town. Engelberg’s small size makes it easy to get around the town on foot. Wear comfortable shoes and pack warm clothing, if you plan on exploring the mountains—the weather can be cool and windy, even in the summer. Attractions, including the Titlis cable car and Engelberg monastery, are wheelchair accessible. Engelberg is located just south of Lake Lucerne in Central Switzerland. Regular trains run direct from Lucerne, or you could drive a car for the short ride by road. The closest international airport is Zurich, via a train journey from Lucerne. Engelberg features photo-worthy landscapes year-round, and although it’s quietest in spring and autumn, most accommodation and attractions stay open throughout. Head there in summer (July–September) to hike in the hills and enjoy water sports on the nearby lakes, or visit in winter (December–March) for skiing, snowboarding, and snow tubing in the mountains. Engelberg’s star attraction is Titlis, Central Switzerland’s highest mountain at 10,626 feet (3,239 meters), standing on its doorstep. Riding the Rotair cable car, a spectacular revolving cable car from Titlis Valley station that climbs 9,908 feet (3,020 meters), is the best way to scale the mighty peak. At the top, adventurous types can tackle the Cliff Walk, ride the Ice Flyer chairlift, go snow tubing, explore a glacier, or enjoy the incredible 360-degree views. Experience Mount Titlis’ dramatic summit on a full-day excursion from Zurich. First, explore the cultural and historical sites of Lucerne on a short orientation drive through the city and then absorb the city’s charm independently during some relaxed free time. Travel onward to Engelberg, a resort cradled by the Swiss Alps, and then ascend to the summit of Mount Titlis for breathtaking Alpine vistas. Take a chairlift to get up close to frozen crevices, and cross Europe’s highest suspension bridge.In winter, from December to March choose the Snow Experience option. Slide down the hill on snow tubes and try skiing once in a lifetime on the beginner slopes – definitely a memorable experience you shouldn't miss. A Titlis Snow Park staff member will provide the equipment and supervise the activities. Ride an aerial cableway from the Alpine village of Engelberg to the summit of Mt Titlis on this afternoon tour from Lucerne. Then squeeze in as many snow-themed attractions as you can during approximately two hours of free time at the top. Your guided day trip includes snow tubing at Titlis Glacier Park plus admission to the Glacier Cave, Ice Flyer chairlift, Titlis Rotair gondola and Cliff Walk — Europe’s highest suspension bridge. What are you waiting for? 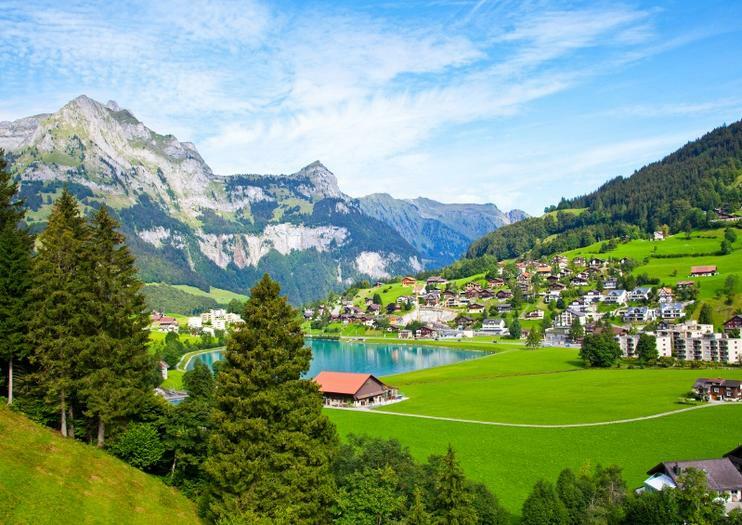 Discover the mountainous majesty of Lucerne and Engelberg on a full-day trip from Zurich. Pass the picturesque Swiss Alps and Lake Zurich as you travel by luxury coach, and then arrive in Lucerne, a charming Swiss town famed for impressive monuments like Chapel Bridge and the Town Hall. Head next to the renowned mountain resort of Engelberg to explore the enticing area independently; visit a Swiss cheese factory; see a magnificent Baroque monastery; or invigorate with a rewarding hike on one of the verdant valley trails. Enjoy illuminating commentary from an expert guide on this enchanting excursion. Discover the spellbinding beauty of Engelberg, a picturesque town located at the foot of Angel Mountain, on an enriching full-day excursion from Zurich. With a knowledgeable guide, delve into the rich history of the beautiful resort town and enjoy some leisurely free time to explore independently. Venture within the legendary Baroque-style monastery to see the largest organ in Switzerland, and marvel at sweeping vistas of the dramatic mountain scenery. Stop in Lucerne on the way back to Zurich to absorb the cultural charm of the city.